Many times getting out is a bit cumbersome due to traffic, and people have taken the option to walk or ride bicycles, using products such as the Xiaomi QICYCLE XC650 bike, and without a doubt this is a great decision, since sometimes It cuts the road and is much healthier than driving, but doing it on a daily basis often exhausts many people, so Xiaomi and Segway have brought a new option to solve these cases. Go shopping, to school, for a walk and even to work if you wish with the Xiaomi Ninebot Segway ES2 electric scooter, which has transformed an artifact that many used in their childhood, in a modern, elegant and fast transport. We invite you to know more about this interesting product below. The Xiaomi Ninebot Segway ES2 has a folding design for easy transport, its construction has built-in resistant materials such as aluminum alloy, which gives resistance without being too heavy, making the Scooter an extremely elegant, lightweight and functional device. The custom LED digital display offers the best of fashion and technology. The Ninebot electric scooter uses a double spring damping system front and rear with an ergonomic curved pedal design, which provides a comfortable feeling when driving. Large-diameter (8-inch) solid pneumatic tires eliminate maintenance problems, while the double electric and mechanical braking system ensures that the braking distance is 4 meters at a speed of 20 km/h, making each trip done safely and without worries. The scooter has a size of 113.00 inches high, 102.00 inches long and 43.00 inches thick (44.49 x 40.16 x 16.93 inches) and a total weight of only 12kg. Powerful 700 W motor for a maximum speed of 25 km/h and a gradient with a maximum of 10 degrees. Easy to fold and unfold, thanks to its folding capacity of 114 x 22 x 15 centimeters to save space and transport it easily. Solid rubber tires capable of supporting different surfaces. Aviation aluminum alloy and rubber materials for a maximum payload of 100 kg. Suitable for children to play on the wide road, slopes, and wherever you want. The mileage achievable by the scooter is more than 20 km, this depends on the weight of the driver and the road surface on which it is driven. Light: Front lamp, side lamp, and tail light. Classification of the battery: 187Wh. Distance from the pedal to the ground (without weight support): 7.3cm. Working temperature: -5 – 40 ° Celsius. With a single click, the Xiaomi Ninebot Segway ES2 scooter can be folded, unfolded and transported easily with one hand due to its weight of approximately 12 kg. 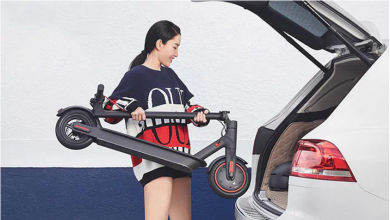 After folding, the electric scooter can be easily placed in the trunk of the car to save space. Salga de paseo, de compras, al trabajo, incluso a fiestas si lo desea con el scooter Xiaomi Ninebot Segway ES2 y disfrute de la vista en el camino, gracias a su gran fácilidad de uso y el poco esfuerzo que necesita aplicar para mantener el equilibrio o pedalear debido a su función eléctrica. The Xiaomi Ninebot Segway ES2 electric scooter is equipped with high-brightness 1.5W LED headlights located on the top of the chassis, on the sides of the wheels and on the underside of the support table, this last light illuminates not only the front but also the surface where it is going, providing a fresh and comprehensive lighting, allowing you to travel at night more safely. At the same time, you can personally set the color and the effect of displaying the LED light through the mobile phone application, as well as choose a warning effect, among many other options. The Xiaomi Ninebot Segway ES2 electric scooter has a smart application, extremely useful and easy to operate, you just have to scan the QR code printed in the manual, you can open the Smart Manager APP anytime and anywhere to customize the options of your scooter, from the effect of lighting to social and safety functions. This scooter has the option of running the battery-powered motor, the battery it has is a lithium-ion (Li-ion) of 5.2 mAh, included in the Xiaomi Ninebot Segway ES2, this has the ability to provide power to reach a mileage of up to 25 km/h. Integrating high-quality batteries with high power for a safe and durable trip. The total duration of the battery is approximately 25km, plus the extended battery life that is up to 45km. The power of the engine is 700W and consists of an intelligent battery management system called Smart-BMS, which closely monitors the operating status of each cell and establishes multiple protections such as charge and discharge protection, protection against low temperature, between others to ensure the safety of the battery and extend its service life. Finally, the input voltage capacity is 110 – 240V. The Xiaomi Ninebot Segway ES2 electric scooter has a reserved capacity for the expansion of the battery interface, the expandable battery weight is approximately 1.5 kg and the high nominal output power is 720 W. The addition of an expandable battery allows your scooter to be more powerful and faster on the road. The voltages of the Xiaomi Ninebot Segway ES2 scooter vary depending on the country you are in, the 110-120V level is available in the United States, Canada, Brazil, Japan and Mexico, and the 220-240V level is available in Brazil, Australia, France, the United Kingdom among many more countries presented below in the image.